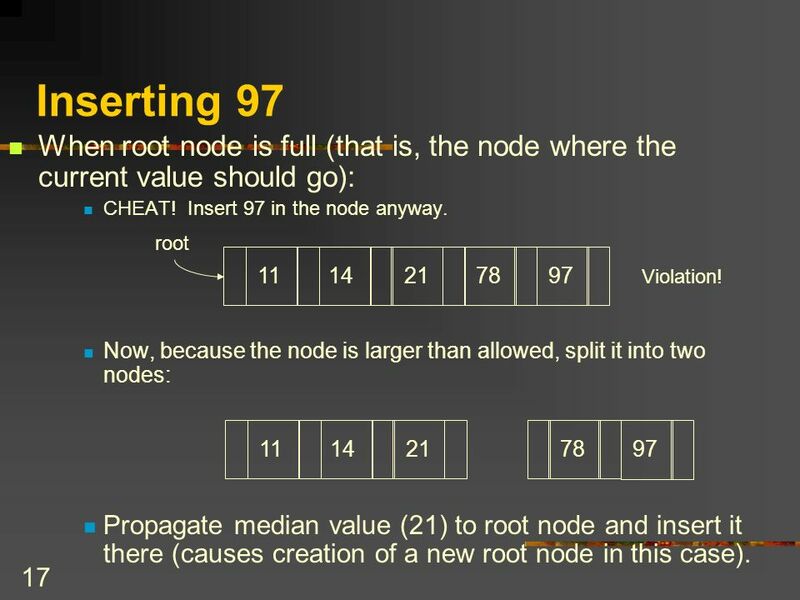 COSC 2007 Data Structures II Chapter 14 External Methods. 8 8 B-Trees Almost all file systems on almost all computers use B-Trees to keep track of which portions of which files are in which disk sectors. 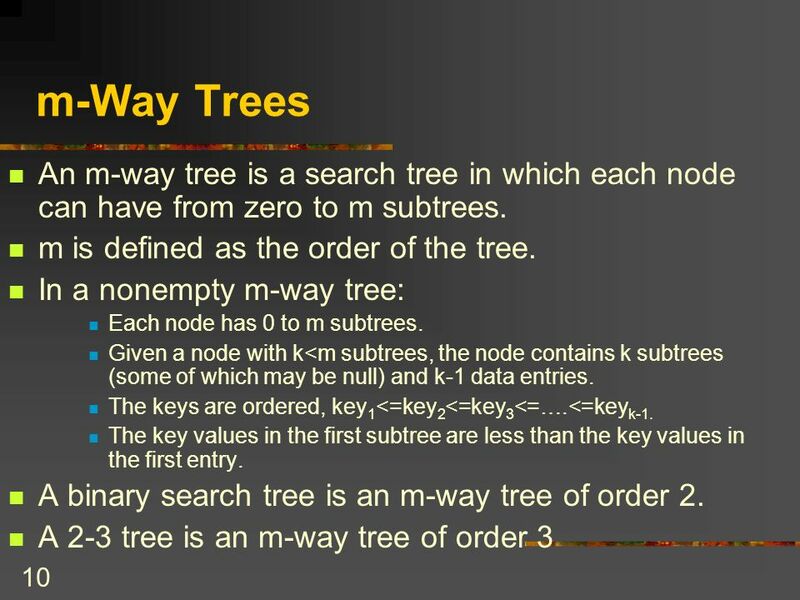 B-Trees are an example of multiway trees. 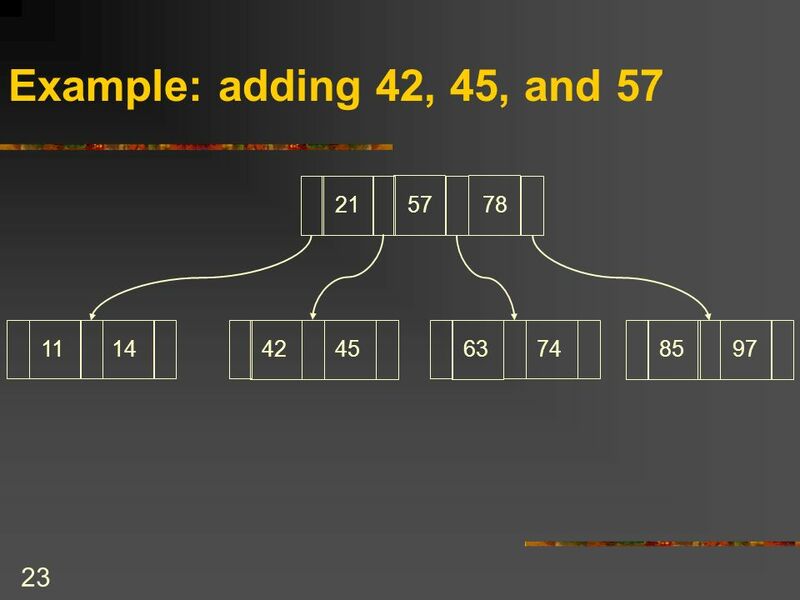 In multiway trees, nodes can have multiple data elements (in contrast to one for a binary tree node). 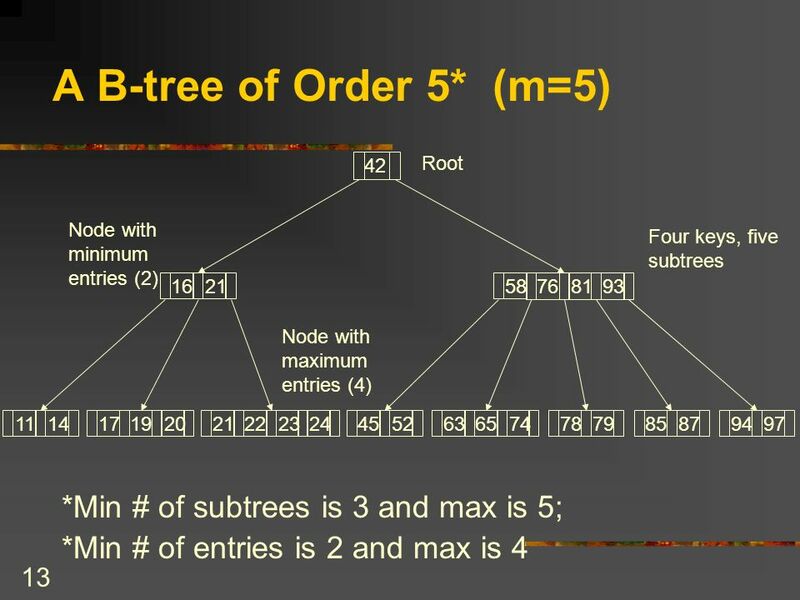 Each node in a B-Tree can represent possibly many subtrees. 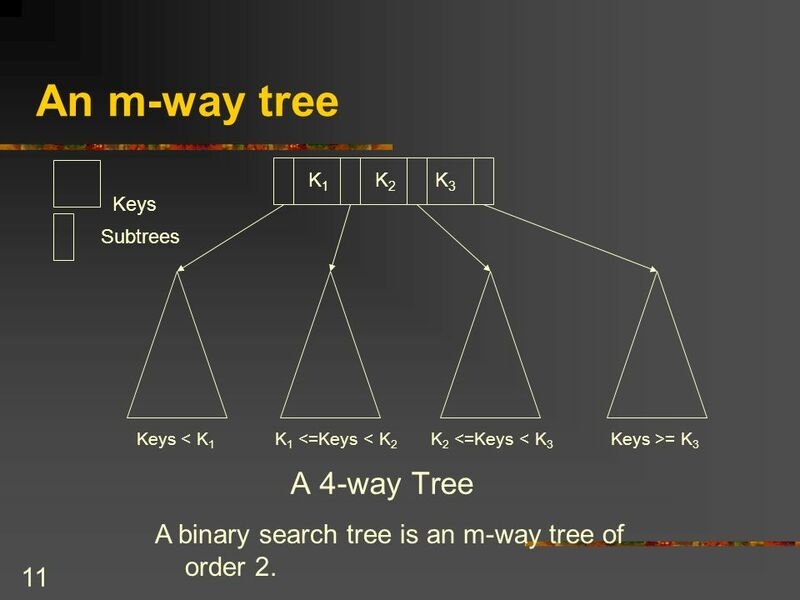 11 11 An m-way tree A 4-way Tree Keys Subtrees K1K1 K2K2 K3K3 Keys < K 1 K 1 <=Keys < K 2 K 2 <=Keys < K 3 Keys >= K 3 A binary search tree is an m-way tree of order 2. 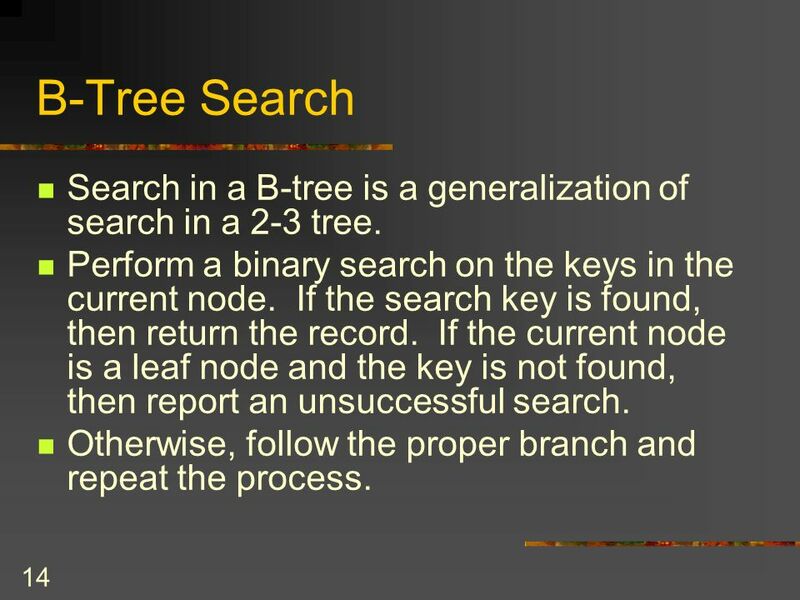 14 14 B-Tree Search Search in a B-tree is a generalization of search in a 2-3 tree. Perform a binary search on the keys in the current node. If the search key is found, then return the record. 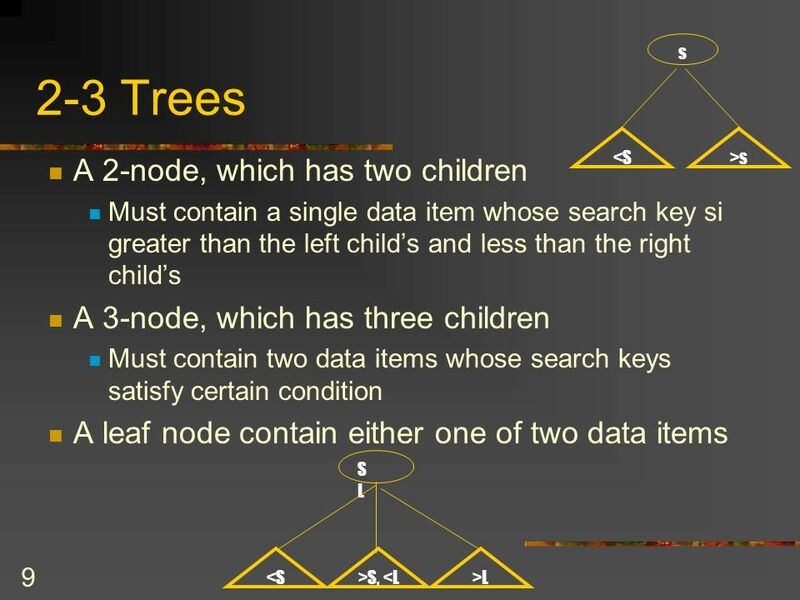 If the current node is a leaf node and the key is not found, then report an unsuccessful search. Otherwise, follow the proper branch and repeat the process. 15 15 Insertion B-tree insertion takes place at a leaf node. Step 1: locate the leaf node for the data being inserted. if node is not full (max no. of entries) then insert data in sequence in the node. 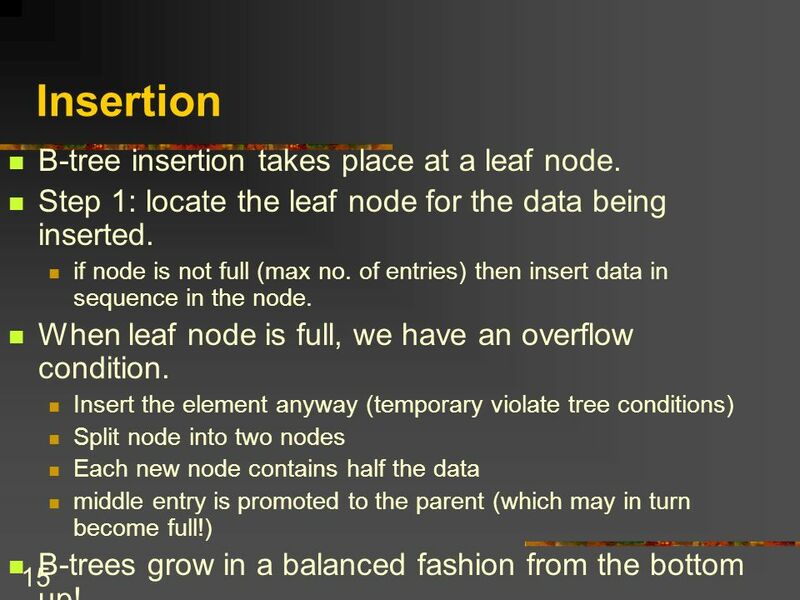 When leaf node is full, we have an overflow condition. 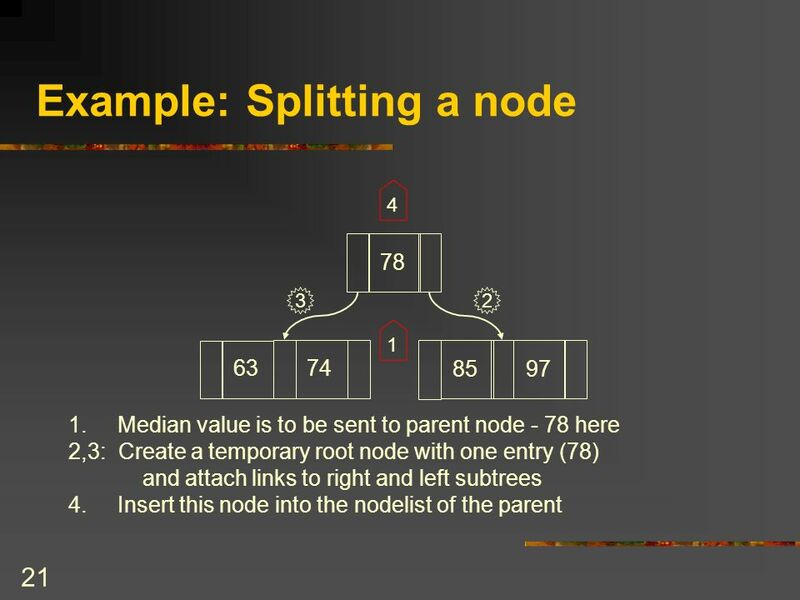 Insert the element anyway (temporary violate tree conditions) Split node into two nodes Each new node contains half the data middle entry is promoted to the parent (which may in turn become full!) B-trees grow in a balanced fashion from the bottom up! 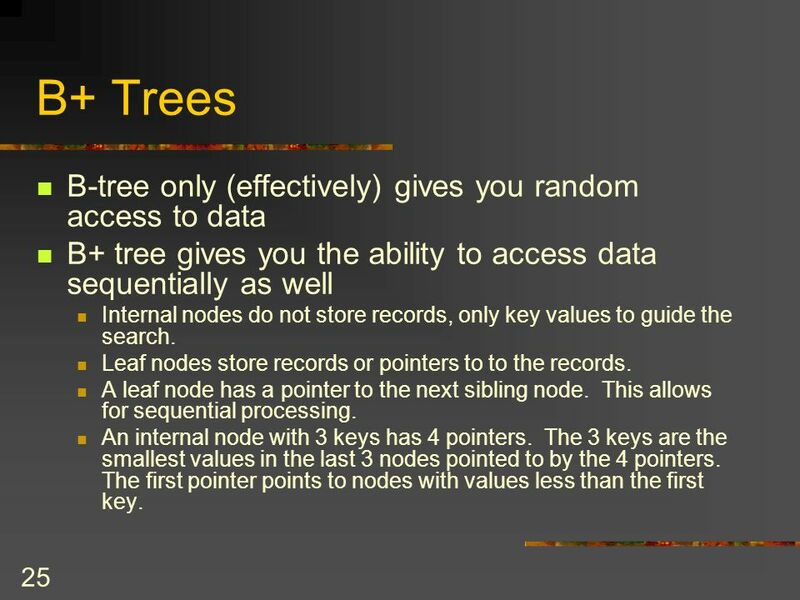 25 25 B+ Trees B-tree only (effectively) gives you random access to data B+ tree gives you the ability to access data sequentially as well Internal nodes do not store records, only key values to guide the search. Leaf nodes store records or pointers to to the records. A leaf node has a pointer to the next sibling node. This allows for sequential processing. An internal node with 3 keys has 4 pointers. The 3 keys are the smallest values in the last 3 nodes pointed to by the 4 pointers. The first pointer points to nodes with values less than the first key. 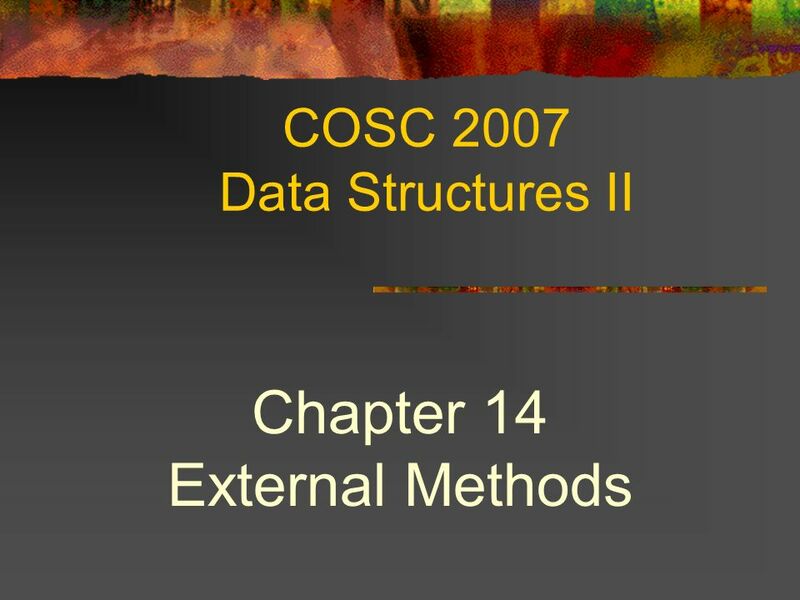 Download ppt "COSC 2007 Data Structures II Chapter 14 External Methods." 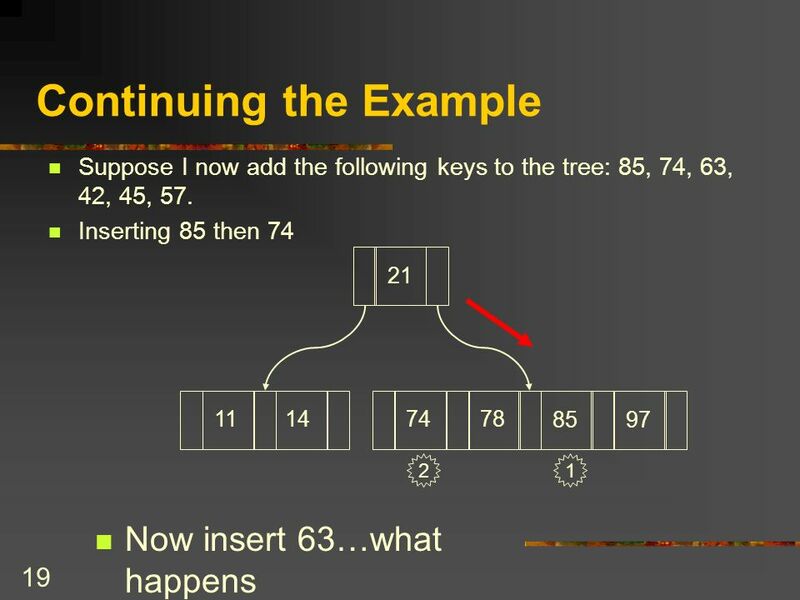 COSC2007 Data Structures II Chapter 10 Trees I. 2 Topics Terminology. 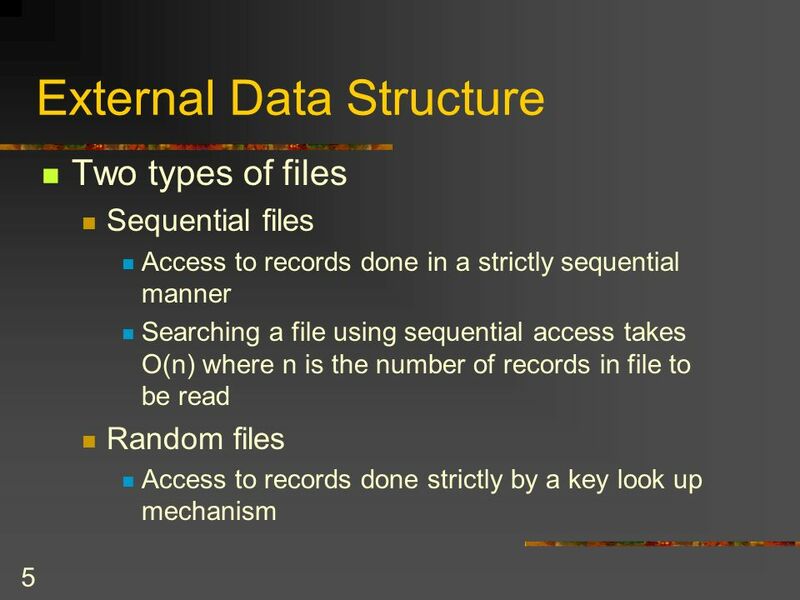 CpSc 3220 File and Database Processing Lecture 17 Indexed Files. 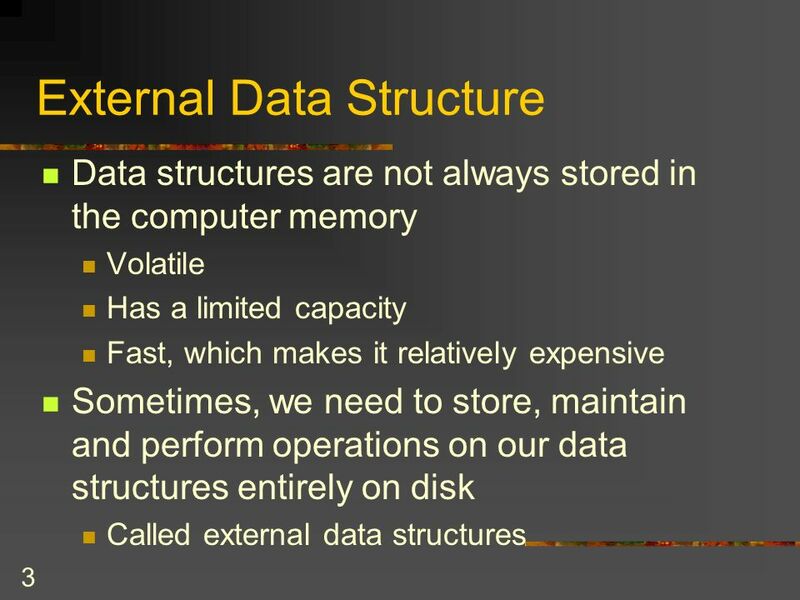 Processing Data in External Storage CS Data Structures Mehmet H Gunes Modified from authors’ slides. Chapter 8 File organization and Indices. 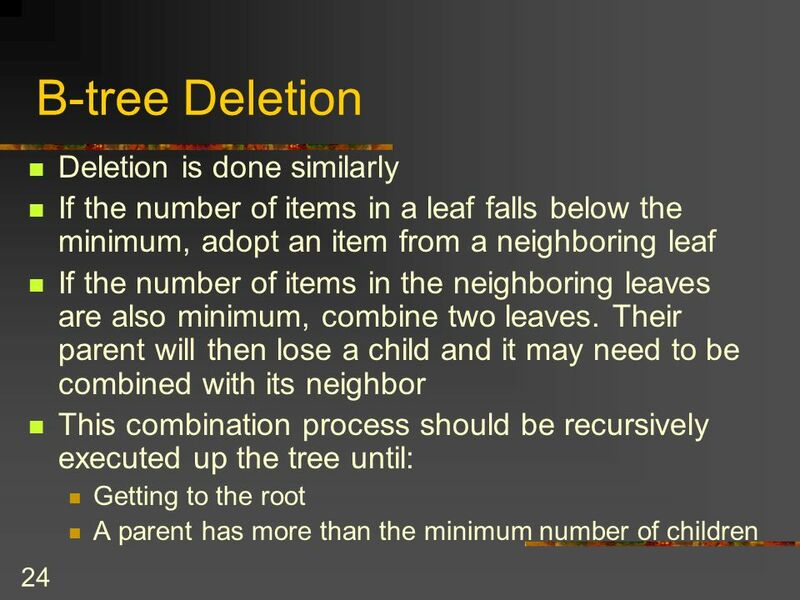 CPSC 231 B-Trees (D.H.)1 LEARNING OBJECTIVES Problems with simple indexing. 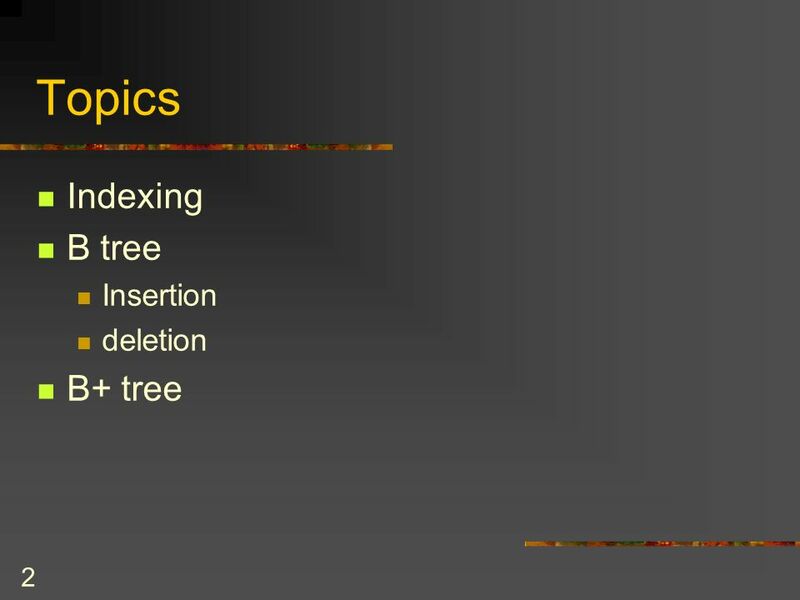 Multilevel indexing: B-Tree. 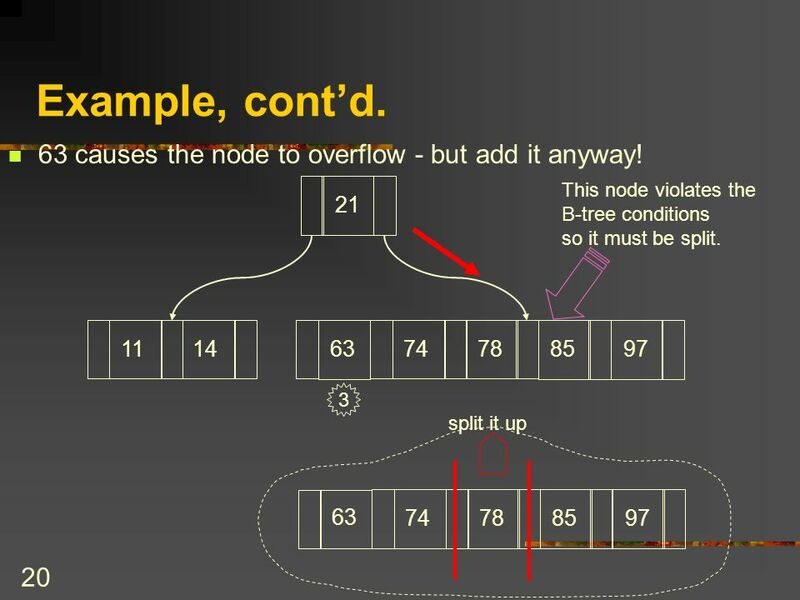 –B-Tree creation: insertion and deletion of nodes. 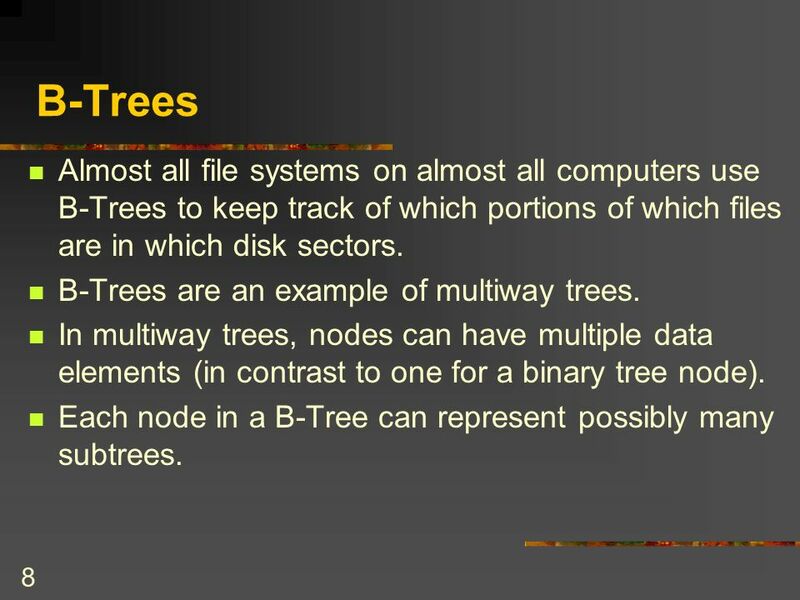 B-Trees Disk Storage What is a multiway tree? 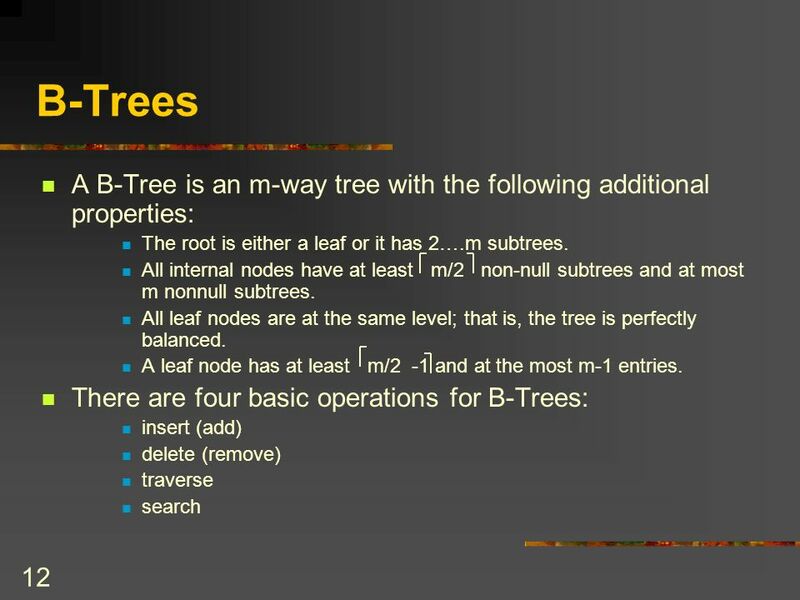 What is a B-tree? ©Silberschatz, Korth and Sudarshan12.1Database System Concepts Chapter 12: Part B Part A:  Index Definition in SQL  Ordered Indices  Index Sequential. 1 B-Trees Disk Storage What is a multiway tree? 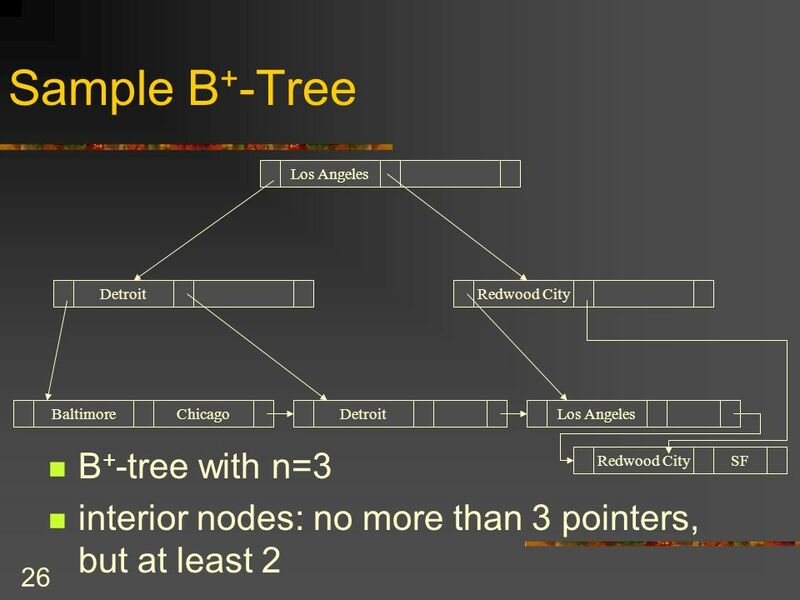 What is a B-tree? Why B-trees? 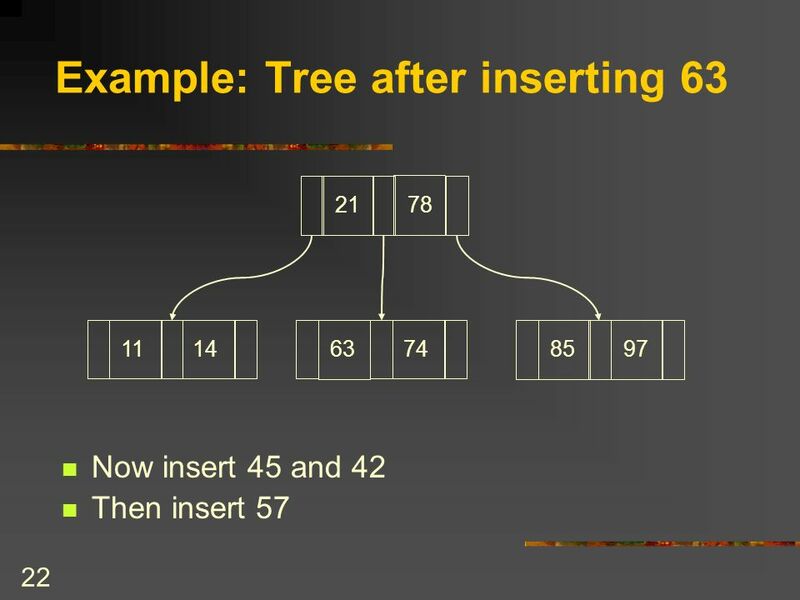 Comparing B-trees and AVL-trees Searching a B-tree Insertion in a B-tree. B + -Trees (Part 1) COMP171. 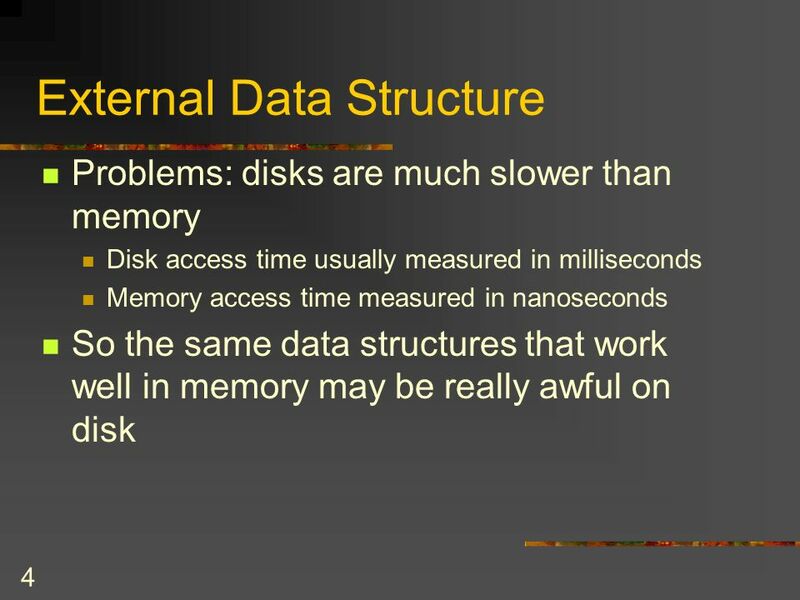 Slide 2 Main and secondary memories  Secondary storage device is much, much slower than the main RAM  Pages and blocks. CSE 326: Data Structures B-Trees Ben Lerner Summer 2007. 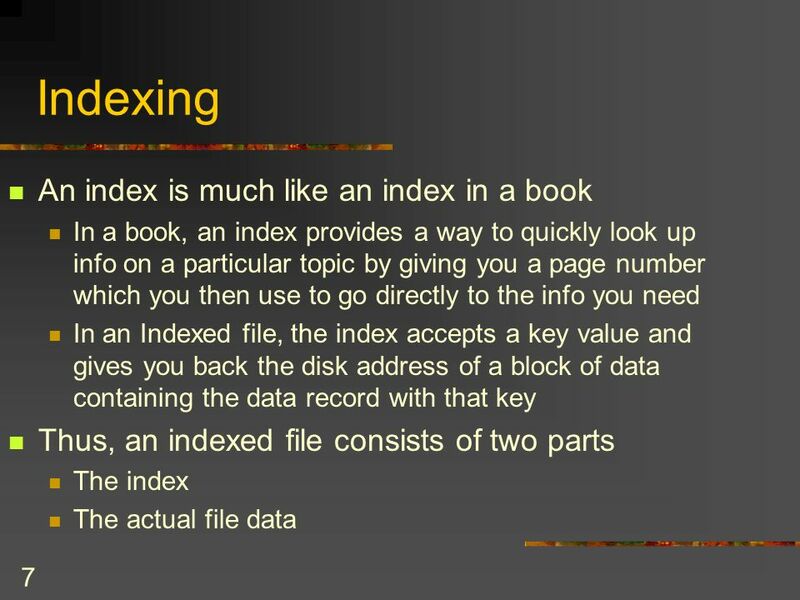 1 Indexing Structures for Files. 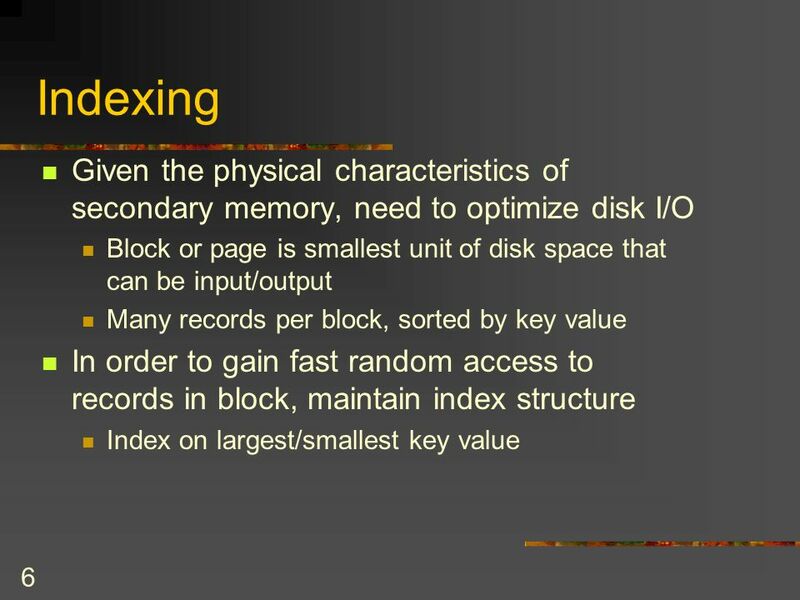 2 Basic Concepts  Indexing mechanisms used to speed up access to desired data without having to scan entire. 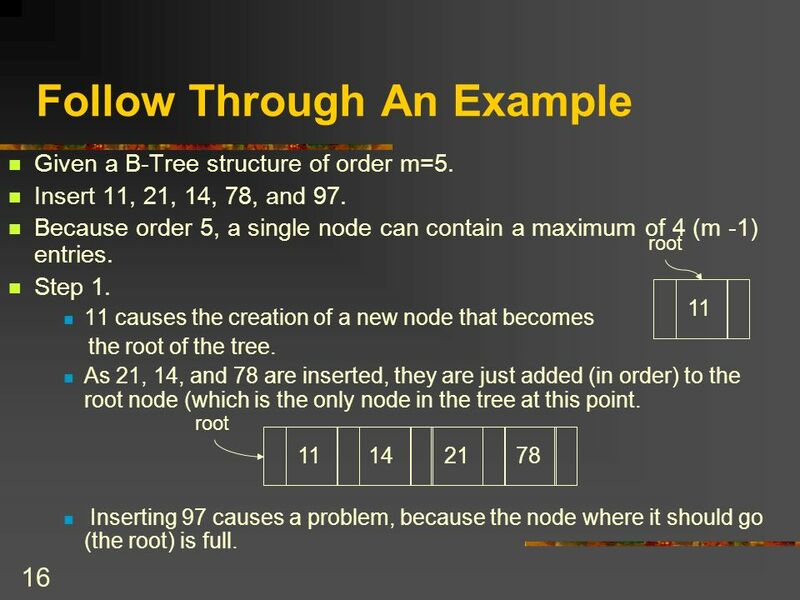 B-Trees and B+-Trees Disk Storage What is a multiway tree? Balanced Trees. Binary Search tree with a balance condition Why? 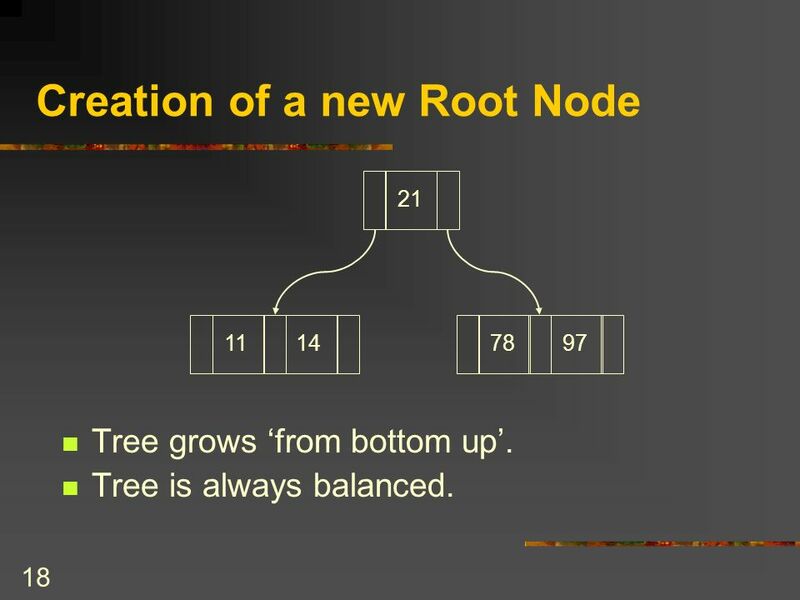 For every node in the tree, the height of its left and right subtrees must differ by.